In this section you'll find information regarding the people, culture and physical plant of Printing Resources. It is important to us that you know who we are, because we want to be the printing company you find easiest to work with. Just follow the links to the left to find out about us. 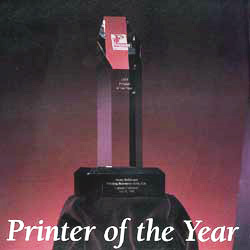 If you'd like to take a tour of our facility, right-click the Printer of the Year award to download a shop tour in PDF format.